Tasty and savoury...this week's delectable home cooked dish is Sesame Chicken shared by home cook Junie Phua. Mixing up chunky pieces of juicy chicken thigh, this dish truly tantalises those tastebuds. A familiar dish that is not difficult to make. Complement this dish with brown rice for a healthier option! Try out this amazing Sesame Chicken dish by cooking it yourself or buy them from Junie today! Here's the full recipe and don't forget to share your photos on our Facebook page! 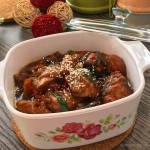 Tasty and savoury...this week's delectable home cooked dish is Sesame Chicken shared by home cook Junie Phua. Mixing up chunky pieces of juicy chicken thigh, this dish truly tantalises those tastebuds. A familiar dish that is not difficult to make. Complement this dish with brown rice for a healthier option! Marinate chicken with 1 tbsp of oyster sauce and 1 tbsp of dark soya sauce, set aside in fridge for 15 minutes. Soak all the wolf berries in 3/4 cup of chinese rice wine. After 15 minutes, drain the wolf berries from chinese rice wine, set both aside. Heat up the wok, turn to medium heat, add 1 tbsp of canola oil and 1 tbsp of white sugar, stir slowly till sugar is caramelised (Till sugar is melted and turned to deep amber colour. Discard it if sugar is burnt. Redo step). Add in the 2 tbsp of Korean sesame oil and all the ginger slices, stir-fry till fragrant and ginger are wrinkled and slightly browned (about 3 mintues). Add in the marinated chicken pieces and stir-fry for about 3 minutes till chicken is nicely seared, about 3/4 cooked. Add in the 1/3 cup of chinese rice wine, 1/2 tbsp of dark soya sauce and 2 tbsp of light soya sauce, the white parts of the spring onions, stir-fry for another minute. Add in the 1/2 cup of water, turn to high heat for 3 minutes till boiling, turn down medium heat and simmer for 10 mintues. Add in the soaked wolf berries and remaining 1/2 cup of water, and continue to simmer for another 8 minutes. Slowly drizzle in the cornstarch mixture (need not use all), and stir constantly till the liquid slightly thickens. Finally, toss in all the spring onions greens. *Optional: Sprinkle on the toasted black and white sesame seeds and serve.